Annette Reilly is seizing the day. 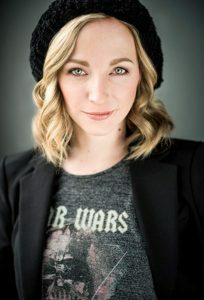 The talented actress and director has overcome daunting obstacles on her quest for creative fulfillment, including a life-changing battle with colon cancer where she discovered silver linings in even the darkest of clouds. We recently sat down with Reilly to discuss raising a teenage witch, instantaneous celebrity, and why her biggest hurdle in life was also her biggest blessing. TrunkSpace: Raising teenagers isn’t easy. Raising a teenage witch… well, that’s well beyond our pay grade! For those who have yet to binge their way through “Chilling Adventures of Sabrina,” what kind of mother is Diana, and how has she influenced her daughter? Where do we see Diana’s impact the most? Reilly: Diana, to me, is a strong willed yet gentle mother. She’s a bit of a mama bear. She’s protective of her daughter and will do anything to keep her safe. I think Diana, being mortal, is a huge influence on Sabrina. I mean, Sabrina was raised by witches. Her struggle is largely to reconcile the two sides of herself, mortal and witch, the mortal side being represented by Diana. TrunkSpace: The series has been receiving an incredible response from fans. What has the experience been like for you, seeing it released into the world and watching the Season 1 reactions occur in real time? Reilly: Oh my gosh. It’s been unreal. I wasn’t sure how the show would be received, and to be totally honest, didn’t really even know what I was getting into when I was cast. There was a fair bit of secrecy surrounding it at that point. The reception has been beyond anything I was expecting. TrunkSpace: Being involved in a series like “Chilling Adventures of Sabrina,” does it have an instantaneous impact on your career as a whole? Does the buzz of one project lead to more doors opening on other projects? Reilly: I would say, in general, yes. There comes an instantaneous “celebrity” status of sorts. I think, as a whole, the more you can get your name out there as an actor, the more rooms you can get into and, as a result, the more roles you end up getting cast in. TrunkSpace: The series intro is fantastic. It’s nostalgic, and yet modern at the same time, while instantly setting the tone for what the viewer is about to watch. When you first read for the series, did that tone come through? Could you get a sense of what the series was going to look and feel like? Reilly: Oh! Isn’t it wonderful?!?! I absolutely adore the opening. I saw it for the first time at the premiere and looked over to my partner and mouthed, “OMG.” It satisfies all my comic book fandom needs. As far as the tone of the show goes… as I mentioned, there was some secrecy surrounding the project when I first read for the role of Diana. Looking back to the audition, I would say yes. The tone was definitely there when I first read. I really had no idea what they would do with it all though. For instance, the lenses they use to shoot this series are insane and give the show such a unique look. I could never have imagined what those would bring to the overall tone. TrunkSpace: Your character’s future is a bit in limbo – literally. Do you yourself know where her future story is heading, or at this stage, is it just as much a mystery to you as it is to the fans of the series? Reilly: This is TV! No one ever knows where the story is heading! (Laughter) Ok, I’m sure Roberto (Aguirre-Sacasa) has a pretty good idea… but it’s a mystery to me! TrunkSpace: For the audience, the most memorable aspect of a series is the finished project, but we would imagine for you, it’s the process of seeing it all come together. What was the biggest highlight of being involved in the series thus far – the moment that you’ll carry with you through the rest of your life/career? Reilly: Oh gosh. There’s so many highlights. I’m really not sure I can pick just one! Doing the floss with Bronson Pinchot, Miranda Otto and Lucy Davis, all in a line, was a good one. I never in a million years thought that would happen. I’ve also developed a wonderful relationship with Georgie Daburas, who plays Edward, Sabrina’s dad. I’m always grateful when a friendship comes out a gig. But, the biggest highlight for me is actually something I can’t talk about yet. Stay tuned! TrunkSpace: Chicken or the egg question. We know that you’re also a director and producer, so which love came first… was it working in front of the camera or behind it? TrunkSpace: What has been the biggest hurdle you’ve had to leap in order to get to this point in your career and what did you take from that experience that you apply to your career moving forward? Reilly: My biggest hurdle was also my biggest blessing. I was diagnosed with Stage IIIb colon cancer back in 2011. I had surgeries, did chemo, the full meal deal. I’m not going to lie, it was tough. My daughter was a toddler at the time. There’s nothing like trying to potty train while you’re doing rounds of chemo. (Laughter) I learned a lot about myself from that experience. 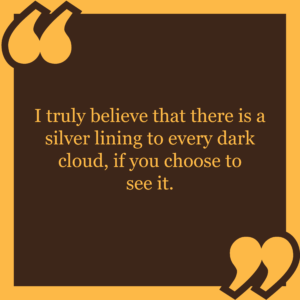 I truly believe that there is a silver lining to every dark cloud, if you choose to see it. My silver lining was that I discovered what I needed to do to live my truest life. I discovered my self worth. I discovered how fleeting this life can be and that I should seize every opportunity. That’s basically how I’ve been living ever since and it seems to be working for me! TrunkSpace: We read that you love high level math, which is a skill set that probably helps in the role of producer, particularly when it comes to staying on budget. What are some other skills that people need – beyond the creative – to work in this industry? Reilly: A tough skin. This is show BUSINESS. A strategic mind and tough skin will help more than you can ever know. You can’t take things personally, or you’re done. Especially as an actor. Reilly: Heck no! I’ve seen enough “Star Trek” episodes to know better than to mess with the space-time continuum. Also, I enjoy the adventure of life. Knowing an outcome before it happens takes the fun out of the journey. And why are we all here if not to enjoy the journey? I’ve been face to face with the end game. I’m good just riding this out as long as possible and enjoying every minute of it. 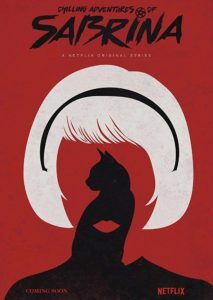 Season 1 of “Chilling Adventures of Sabrina” is available on Netflix now.